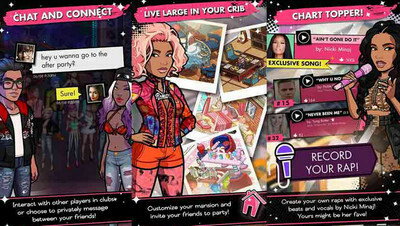 Fans of hip hop superstar Nicki Minaj, get ready to feel a taste of fame and fortunes with her new game Nicki Minaj Empire, which we have an awesome hack for. Start small and build your reputation as an artist, record your music, and become a star now! This modded apk of Nicki Minaj android game will get you infinite crowns, cash, and energy to become the star you deserve to be. Focus more of the fun aspect of the game, and less on the distracting inapps. With our NICKI MINAJ unlimited money apk, you can bring out your artistic side, and definitely rise as a superstar and rival the hip-hop queen herself! If you've played Kim Kardashian Hollywood game hack then you must be familiar with the style of these games. It's a virtual experience that lets you become your favorite celebrity and discover how it's like to be them. - Hot NEW clothes! Customize your avatar with even more new looks! - More NEW Chat Rooms to hang out in with your friends! - NEW Quests! Live the dream and expand your hip-hop empire even further! - Meet NEW characters in Atlanta, challenge a new rival! - You Must use my obb for the hacks to work!! - If Game stuck when login Google Play Games, press back button & cancel. Install the Apk file, Extract Obb file to internal storage /Android/Obb/ , and play the game. UnSigned Apk can be requested. This is Nicki Minaj The Empire 1.2.0 which was released on February 28th, 2017. Have fun! 2. Install "NICKI.MINAJ.THE.EMPIRE.v1.0.1_apktron.com.apk" but DON'T RUN THE GAME YET! I did everything right when I loading the game up I'm getting a error saying failed to download game assets? What should I do??? there's been an ingame update i think, that's why people started receiving that error! will try to update the mod as soon as i can! contacting modder now..
make sure u have enough space on phone also! It always close itself after launching it. Both MOD APK and OBB installed. On Android 7.0. Anyone having difficulties saving the game? Like it rolls back progress?